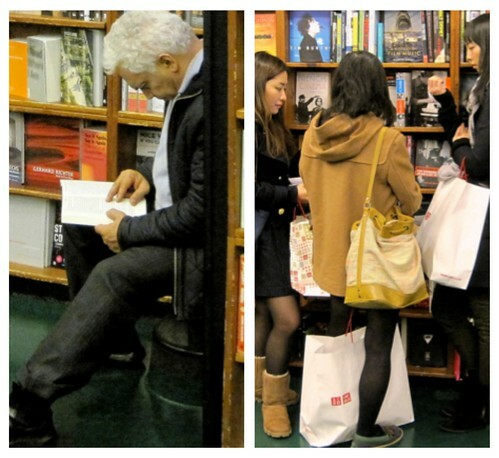 Last night, politicians and neighbors gathered at the St. Mark’s Bookshop to celebrate the lowering of its rent. So the bookstore survives, but for how long? Will it still be on the corner of Ninth Street and Third Avenue in a couple of years? Or will there be a giant bubble tea shop there instead? It seems like a good time to document an institution of a kind that’s vanishing from the East Village. 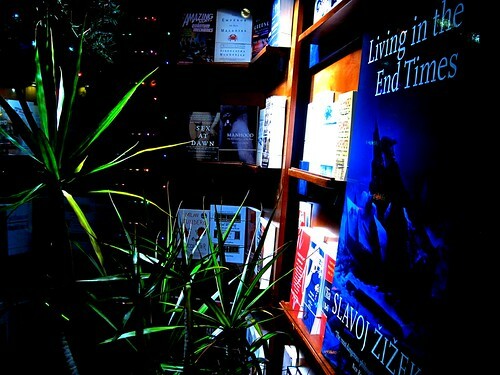 As a physical space, St. Mark’s Bookshop is sort of retro-futuristic, and more theatrical than relaxing. There is a big-city sense of being on stage. 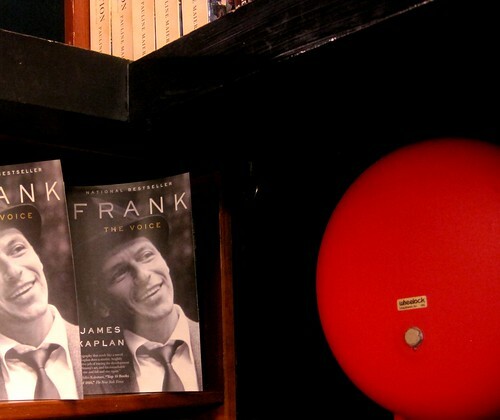 No attempt is made to foster the kind of somnolent, wood-paneled cubbyhole atmosphere so beloved of the stereotypical independent book store. Anyway, it would be a difficult trick to pull off, what with those HVAC pipes slithering around above the customers’ heads like giant, interstellar worms. 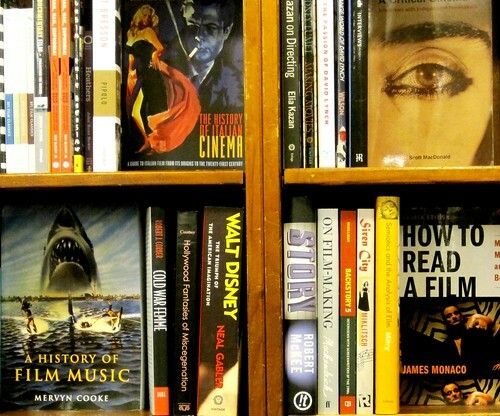 Exposing us to literature – defined in my dictionary as “writing regarded as having permanent worth through its intrinsic excellence” – is the central purpose of St. Mark’s Bookshop, and correctly or not, the majority of readers still think of the novel as literature’s supreme genre. The novelist remains the Glamor Man or Woman of Letters, although serious nonfiction sells better than literary fiction, as does almost everything else. Nonetheless, starting at zero and an empty computer screen, novelists still win extra points for their ability to create something out of nothing. 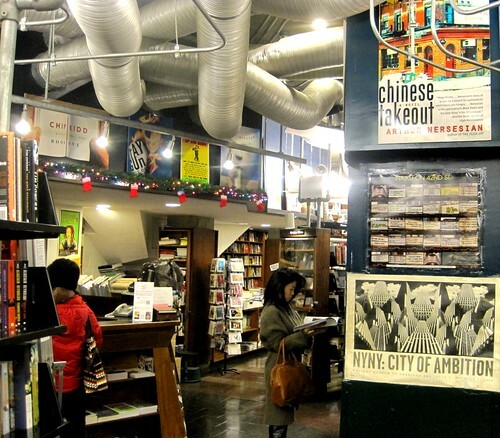 One of the reasons we like bookstores is that they’re congenial public spaces with little pressure to buy – but it’s a problem when your rent is $17,500 and many people leaf through books and magazines without buying them, or just stand around and talk. St. Mark’s is famous for its “Cultural and Critical Theory” section, and people either find it digestible or they don’t. 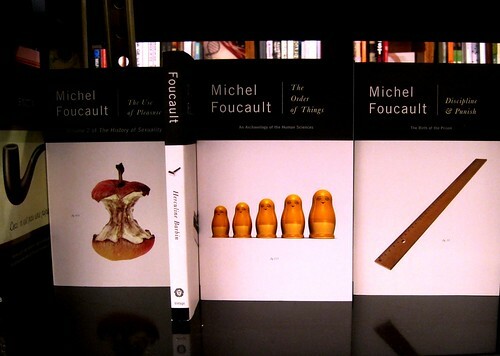 Here is a display of works by Michel Foucault, the late Parisian Philosopher King, with graphically simple but striking covers: a well-chewed apple for “The Use of Pleasure”; a ruler for “Discipline & Punish.” (Foucault belonged to the generation of kids who got rapped on their knuckles by ruler-wielding teachers if they misbehaved.) A whole class of readers goes to St. Mark’s just for books like these. “Oh, yeah? 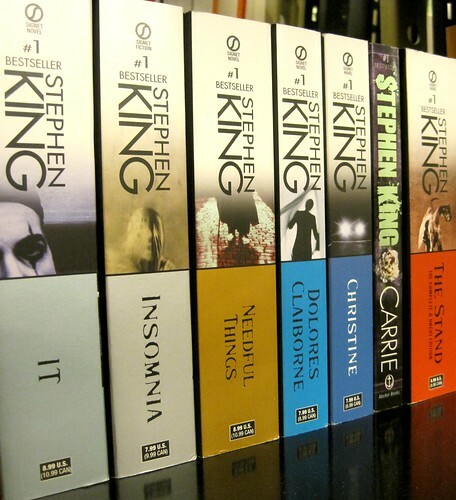 And what about books like these?” says the Man, the Monarch, the King. The store has a terrific thriller section as well. What with all the smoke getting in his eyes, Frank thought the wisest course would be to hang out by the fire exit. 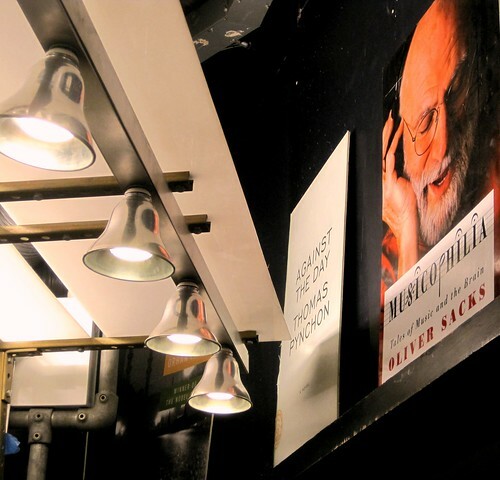 Here’s an example of why some people are so enamored of St. Mark’s: It’s one of the few bookstores in New York that would put up a poster of a mad-looking experimental French novelist who can’t even boast a serious cult following. 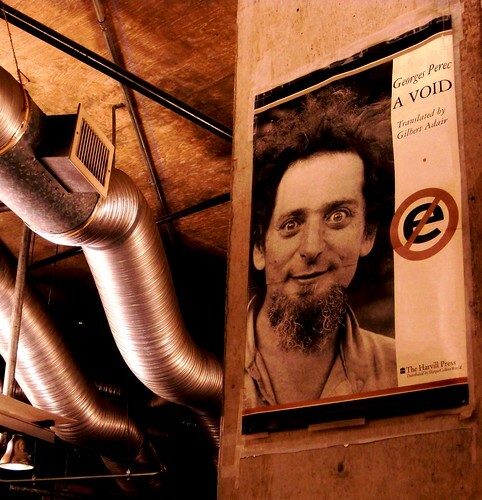 “A Void,” the book advertised, is renowned in avant-garde circles for the fact that Mr. Perec wrote it without using the letter “e,” although his most celebrated novel is “Life: A User’s Manual,” about the inhabitants of an apartment building in Paris. Mr. Perec died of lung cancer at age 45. Five years later, in 1987, his close friend, the Paris-based American novelist, Harry Mathews, dedicated his wonderful novel “Cigarettes” to him. (Its title, which bears no relation to the text, was probably an oblique reference to Perec’s compulsive tobacco habit.) Mr. Mathews, a fellow experimentalist and a native New Yorker, keeps an apartment just outside the East Village. An old friend of John Ashbery and a first-generation member of the New York School of Poets, he brings this French writer a little closer to home. Oliver Sacks: How can you not love someone who wrote a book called “The Man Who Mistook His Wife for a Hat”? (And it wasn’t even fiction!) Mr. Sacks, an English-born neurologist, has a special connection to this neighborhood. When he moved to New York in 1965, he befriended the poet W.H. Auden, and visited him often at his apartment on St. Marks Place. As books struggle more and more to find an audience, eye-catching covers become increasingly important. Knowing how to display them effectively is a minor art form in itself. And how better to catch a reader’s eye than with a cover dominated by an eye in one corner and the shark from “Jaws” in the other? 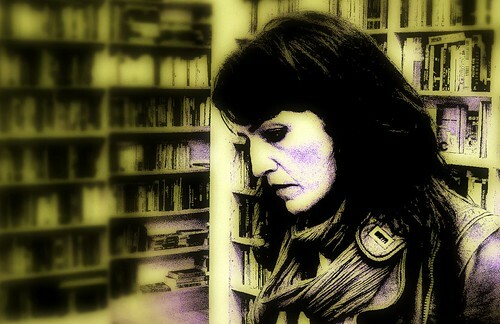 I call this manipulated portrait “The Reader,” and it is intended as a symbol of our dissolving literary moment in which books are – what exactly? This woman – the reader – is depicted as a quasi-Decadent, complete with blue and green makeup (added by me) which, plague-like, has infected the books in her immediate vicinity, while those further away are on the point of vanishing altogether. The idea was to reimagine readers of traditional paper books as rarities and even freaks, which they may soon be. At the same time, I wanted to suggest that the very objects which historically have defined someone as a “reader” – the books themselves – were paradoxically growing distant, illegible, and increasingly unrecognizable even as we reach out to them. It was the best of times, it was the worst of times, and according to the fashionable Slovenian philosopher, Slavoj Žižek, it was also the END TIMES. Even if you thought the Slovenian was too fatalistic, the store’s notoriously brusque staff clearly did not. It was five minutes to closing time, and they cleared the place in about 30 seconds flat.